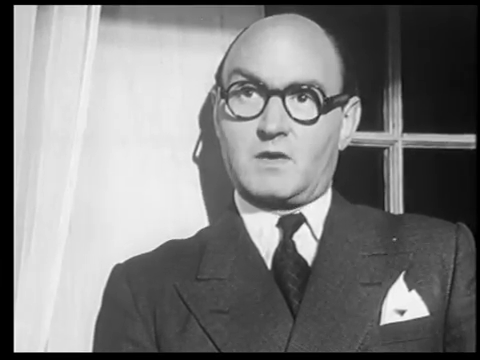 UK / 82 minutes / bw / Two Cities, Rank Dir: Anthony Asquith Pr: Antony Darnborough Scr: William Fairchild Story: The Net (1952) by John Pudney Cine: Desmond Dickinson Cast: Phyllis Calvert, James Donald, Robert Beatty, Herbert Lom, Muriel Pavlow, Noel Willman, Walter Fitzgerald, Patric Doonan, Maurice Denham, Marjorie Fielding, Cavan Watson, Herbert Lomas, Cyril Chamberlain. Behind the net—the wire fencing—of secret UK research establishment Port Amberley, the team led by Michael Heathley (Donald) has finished developing the experimental supersonic nuclear-augmented jet aircraft code-named M7. All that remains is to test-fly the prototype, something Michael wants to do immediately, in conjunction with pilot Brian Jackson (Doonan). But the site’s boss, Professor Carrington (Denham) is cautious, and insists it’s too early to risk human lives, that there should be remote-controlled test flights first. But then Carrington dies as a result of a mysterious accident and Michael decides, over the objections of several of his colleagues, to take the plane up. Brian, despite thinking this is a lousy idea, reluctantly agrees to co-pilot. 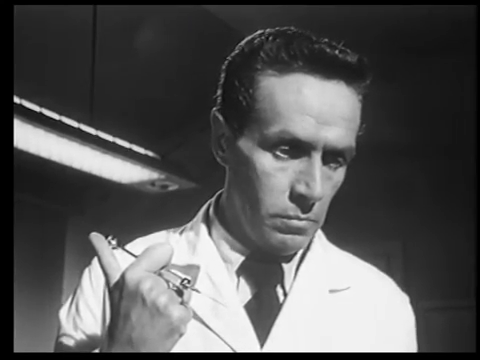 Noel Willman as Dr. Dennis Bord. What we know but the main characters don’t is that the project’s physician, Dennis Bord (Willman), ushered Carrington out of this life by withholding a vital injection. Could Bord be the source of unexplained leaks of the project’s secrets? We also know something that Michael, in particular, doesn’t: thanks to his neglect of her, his wife Lydia (Calvert) has become receptive to the adulterous approaches of charismatic Alex Leon (Lom), the scientist in charge of M7’s ground controls. 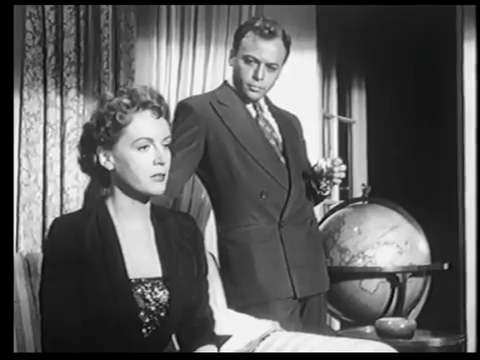 Phyllis Calvert as Lydia and Herbert Lom as Alex. 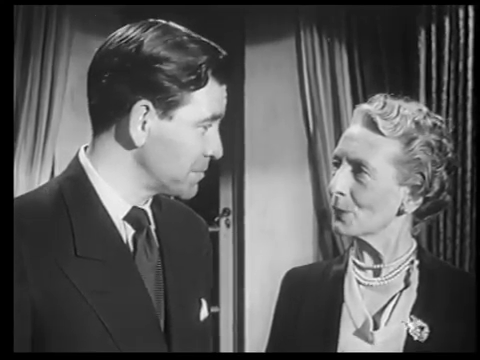 Robert Beatty as Sam Seagram and Marjorie Fielding as the senior Mrs. Heathley. Rounding out the cast are Robert Beatty as security officer Major Sam Seagram, Walter Fitzgerald as the Man from the Ministry responsible for the project, Sir Charles Cruddock, Marjorie Fielding as Michael’s mother, Cavan/Caven Watson as Sots Nat project scientist Dr. Ferguson, and site favorite Muriel Pavlow as Caroline Cartier, Michael’s administrative assistant, Brian’s soulmate, and boon to air-conditioning manufacturers everywhere. Muriel Pavlow as Caroline and Patric Doonan as Brian. 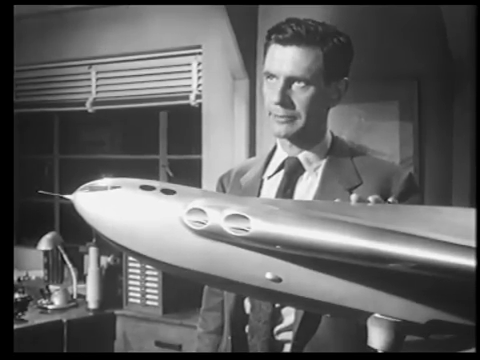 James Donald as Michael Heathley, with his true love, the M7. I can’t imagine that The Net had too much of a budget, yet within its necessarily narrow parameters it’s a surprisingly good little movie. Within a fine cast—although Willman’s arguably a weak link—Phyllis Calvert is outstanding as the morally unimpeachable woman who becomes momentarily tempted by transgression: Calvert had such an expressive face, and she uses it here to great effect. 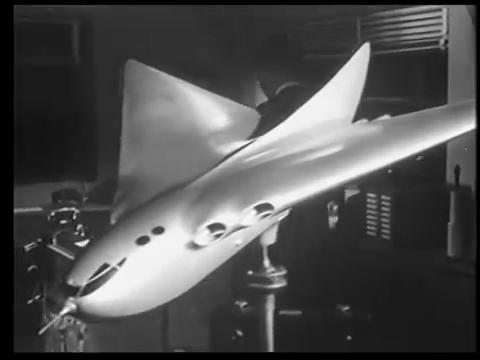 The model work featuring M7 and its flights is really quite splendid for its era, and this contributes to the definite—and unexpected—excitement of the prototype’s first test flight and then the final confrontation between Michael and the spy. 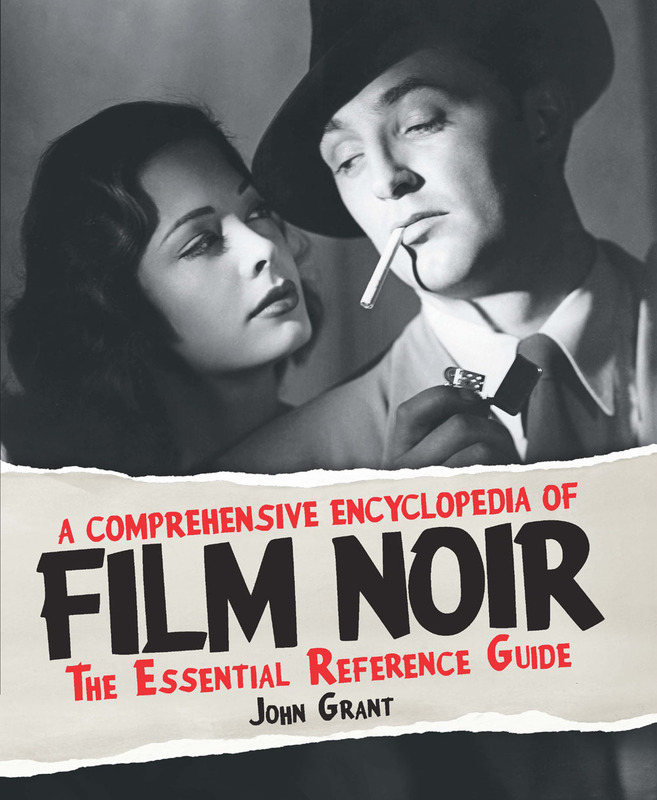 This entry was posted in Uncategorized and tagged Anthony Asquith, Cavan Watson, Cyril Chamberlain, film noir, Herbert Lom, Herbert Lomas, James Donald, John Pudney, Marjorie Fielding, Maurice Denham, MINE OWN EXECUTIONER (1947), Muriel Pavlow, Nigel Balchin, Noel Willman, Patric Doonan, Phyllis Calvert, Project M7 (1953), Robert Beatty, Suspect (1960), The Net (1952), The Net (1953), The SMALL BACK ROOM (1949), UK borderline noir, Walter Fitzgerald. Bookmark the permalink. Can’t quite imagine how Anthony Asquith ended up making this given the films he was putting out at the time but glad it is worth seeing at least! It may have seemed more prestigious then than it does today — it has a decent enough cast, and must have seemed very up-to-the-moment, state-of-the-art stuff in 1953.